My Notes Center can organize and store all your information. Your personal notes, emails, web links, phone numbers, addresses and much more. It can even store your private information like passwords and credit information. With its added security it provides you with data protection features. It uses a very fast Blowfish448 encryption algorithm for protecting your information. You can specify up to 56 symbols as a password to protect your notes and keep it from other’s eyes. It stores your data in the .mnc extension to provide you with added security, which is not possible in a text format. It has other convenient features, which help you in formatting and maintaining your notes well. You can store your notes in a convenient tree structured form, with advanced text and paragraph formatting actions. 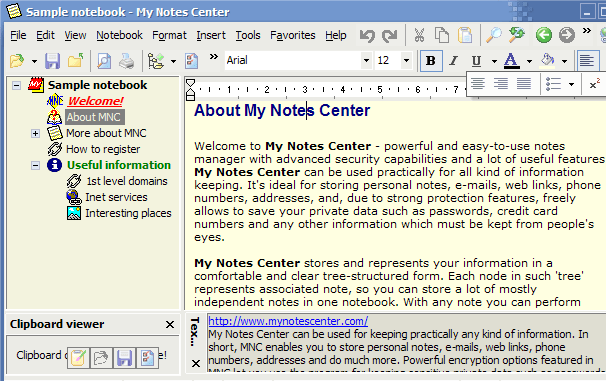 It allows unlimited note size and number of notes in the notebook, which opens and works with several notebooks at one time. It also provides MS Active Accessibility support, very helpful for people with disabilities.